Whether you need to get rid of an old fridge, or clear out the garage in full, you will surely appreciate some specialised assistance on our behalf! Reluctant to do so in fear of excess service costs? Please don’t be, as our specialised junk removals in Bulls Cross are the most affordable and efficient option available right now. We aim to provide our domestic customers in EN2 and EN3 areas with genuine value for money and excellent quality waste removal services. Garden rubbish, green refuse, old gardening tools etc. In addition, we also offer specialised skip hire and comprehensive house clearances. No permits or waiting periods required to use our skip hire service as we are fully licensed and insured. Property clearances will be scheduled for a suitable time and day of the week, and completed within the shortest time possible. All recyclables like plastic, metal, wood and paper (as well as all other salvageable items and materials) are transported to specialised waste processing facilities where they are turned into useful raw materials once again. We have permits for using all recycling depots in London and will provide customers with valid waste transfer notes to customers upon request. To give the environment a small breather we use low emission waste removal vehicles on all jobs. Our junk removal services in Bulls Cross aim to provide genuine value for money without compromise on quality or efficiency. We adhere to a strict fair pricing policy and only charge for the waste we actually collect and remove. There are no hidden fees or unmentioned additional charges. We offer custom tailored pricing and onsite quotations for more accurate pricing which meets specific budget requirements. Hiring us is a simple and straightforward process which can be done in a manner of minutes and with the assistance of our friendly and courteous customer consultants. Don’t be shy to contact us on a short notice because we accept last minute bookings due to the fact that we work with a well-organised and flexible agenda. You can rest assured that your Bulls Cross junk removal will be handled at a day and time that best accommodates your personal preferences and, professional and private calendar. Bulls Cross is a rural settlement, and a low populated area in the northern end of the Enfield Borough. It is believed the area’s name is derived from a local family who lived there sometime during the thirteenth century. The Capel Manor, which came into existence in the fifteenth/sixteenth century, does actually occupy the site of the former thirteenth century estate responsible for establishing the locality. The existing manor house (still surviving today) was constructed in seventeen fifty. 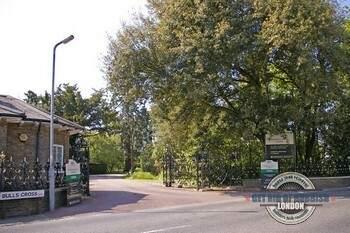 Bulls Cross is home to London’s only horticultural school of agricultural studies. Capel Manor College (the horticultural school) is a beautiful complex of facilities, architecture and landscaped garden surroundings which is also open to the public. The district of Bulls Cross is heavily associated with the top tier professional football club of Tottenham Hotspur due to the fact that the team’s new training centre is situated in the area. The construction of the practice grounds commenced in 2009 and ended in 2012 when the centre was officially opened by the club’s owners. It is because of this that you can regularly see Tottenham Hotspur supporters roaming throughout the area and attending the local public houses and bars. We do all lines of junk removal in Bulls Cross jobs that you can imagine. If you need a garage clearance, after builders clearance, general household and office waste removals in EN2 and EN3 carried out with professionalism and care for the detail, we are the right people for you. Did we mention that we offer the best prices rubbish removals in Bulls Cross come on? Large parts of Bulls Cross fall into the territory of the Metropolitan Green Belt, which means that the area is rich in open green spaces, including parks, commons and forests. The first certain recorded mention of Bulls Cross in official documents dates to 1465 as Bedelscrosse. One of the major amenities in the district is the Tottenham Hotspur training centre, which opened in 2012. Pied Bull and Capel Manor are landmarks you should definitely check out.